A 37-year-old man, Sylvester Chukwunwendu (pictured above) who runs a notorious drug syndicate in Nigeria has been apprehended by the officials of the National Drug Law Enforcement Agency NDLEA. 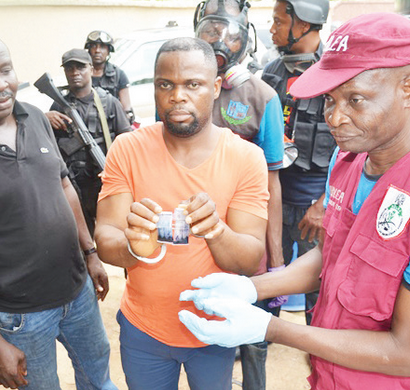 Parading the suspect before newsmen in Lagos, the National Chairman of NDLEA, Ahmadu Giade said Sylvester, who runs a methamphetamine production laboratory in his house at in the Ajao Estate, Isolo area of Lagos, was arrested at Ozubulu in Ekwusigo LGA of Anambra State following a tip off. Sylvester hides under the cover of different company names such as Blessed Benita Global Limited, Ideal Motorcycle Company Limited and God’s Special Enterprise Limited which he owns to run the illicit business which has some international affiliations. He employs men and women who he pays as much as $5,000 per trip to traffic the banned substances to China, Malaysia, Turkey and Italy. The Chairman said he will soon be charged to court.